ST. PETERSBURG -- Visitors to Allendale UMC’s Earth Care Event had a chance to pick up some free plants and seeds, hop aboard a hybrid public bus, listen to a Native American flute concert and explore a community garden. They also were encouraged to stop in the chapel to reflect on the beauty of the earth and the role humans play in caring for creation. David McGuire of Boyd Hill Nature Preserve was among exhibitors to turn out for Allendale UMC's Earth Care festival. Photo from Allendale UMC. The April 20 event featured many opportunities to learn. 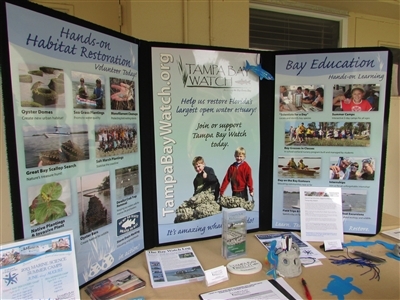 There were information booths from such groups as the Tampa Bay Estuary Program, Tampa Bay Watch, University of Florida Institute of Food and Agricultural Sciences, Sierra Club, the Pinellas chapter of The Florida Native Plant Society and others. Rev. Andy Bell, executive director of Sunshine State Interfaith Power & Light, and his wife, LaDawn, traced the steps they’ve taken to become better stewards of the earth. They started small, hanging clothes to dry, rather than tossing them in the clothes dryer; switching to more efficient light bulbs; turning up the thermostat; using a rain barrel to catch water to use in their garden. As time went on, they bought a more fuel-efficient car, replaced most of their grass with ground cover, planted a garden and had solar panels installed on their roof. Their monthly electric bill went from slightly more than $129 a month, to slightly more than $10. LaDawn Bell said they have made changes in their personal lives to put the words they preach into action. 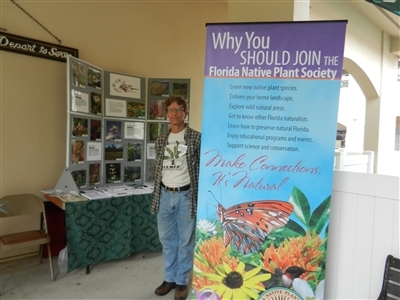 An exhibit from the Florida Native Plant Society tells how Florida's homegrown plants help the environment at Allendale UMC's Earth Care event. Photo from Allendale UMC. He tells them that being good stewards is what Scripture commands. There are other important issues, he said, but they become moot if those issues aren’t addressed. Martha Pierce, coordinator of the Caring for Creation task force of the Florida UMC conference and director of the conference's Riverside Retreat, was pleased by Allendale’s initiative. She said Riverside will participate in an Earth Week exhibition for schoolchildren later this week. “I’m excited to see at least a few churches getting on board,” Pierce said. “We’ve got a lot of education to do. A lot of people don’t understand the biblical mandate of care for Earth,” said Pierce, who recently attended the national Caring for Creation conference at Lake Junaluska, N.C.
Tampa Bay Watch, a nonprofit environmental stewardship organization, offers ways people can get involved in environmental protection. Photo by B.C. Manion. Churches that want to go green can start small, she said. “I’d start with the Bible and give them examples of what the Bible had to say about creation care. Start with some basics of what everyone can do at church and at home. “They need to focus on being proactive. Study and learn. Don’t worry about opinions, so much as the facts,” she said, adding it’s important to pay attention to the source of the information and to seek unbiased reports. The Rev. Danny Bennett was manning the Sunshine State Interfaith Power & Life booth. “One of the things that we focus on is reducing our reliance on nonrenewable resources,” said Bennett, pastor of Clearview UMC, also in St. Petersburg. Churches can get the green conversation going by starting small, he said. The first thing his church did was station recycling bins around the church, so people could recycle bulletins that they didn’t intend to keep. Tampa Bay Estuary Program sets up a display at Allendale UMC to highlight its "Be Floridian" campaign. 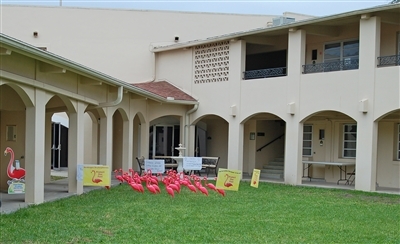 The iconic plastic flamingoes are intended to remind homeowners to avoid fertilizer use in summer so that it does not pollute waterways. 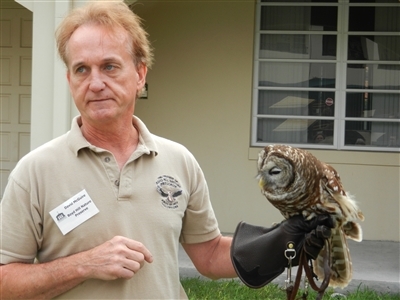 Photo from Tampa Bay Estuary Program. Suzy Hutto and Cheryl Volkman, members of Allendale’s Green Team, were gratified by the number and quality of speakers and exhibitors that took part in the event. While they had hoped for a larger crowd, they were pleased by the church’s involvement. Both women said they were inspired by Bishop Ken Carter’s recent letter encouraging churches to become more engaged with caring for the earth. “That letter was amazing. It totally spoke to me,” Volkman said. The church needs to help lead the community in becoming better stewards of the earth, said the Rev. Ronnie Jones, pastor at Allendale. “We want to leave generations behind us the rich, lush earth that we have,” Jones said. B.C. Manion is a freelance writer based in Tampa.